I am so glad Friday is over...most people always talk about "Oh man, TGIF!" but for me, yesterday was just a relief to be done with. Ha, I had not one, but two of my first college exams! One was in Music Appreciation, which was actually pretty easy (don't want to jinx it though, we'll see how it went), and then one in Math. Ugh, now that one I'm questioning. I was cramming like crazy the night before and even the morning of for that test! The thing with math is that one tiny miscalculation could screw you over. I'm such a worrywart though. I have this perfectionist frame of mind when it comes to grades, so I turn into a major stressball at the mention of tests, let alone exams! Needless to say, I'm dreading finals week...ha! This outfit pretty much put itself together. 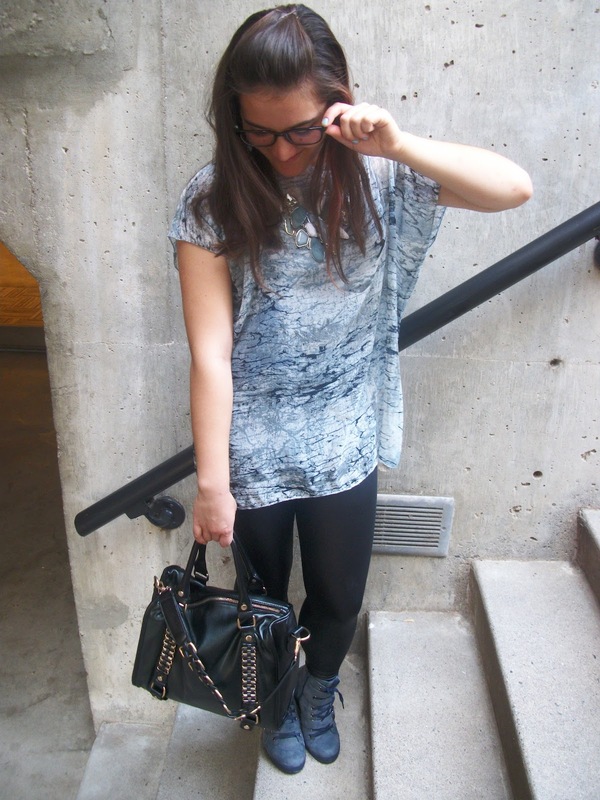 The shades of navy-grey and black flowed seamlessly, and it was fun getting dressed up a bit. 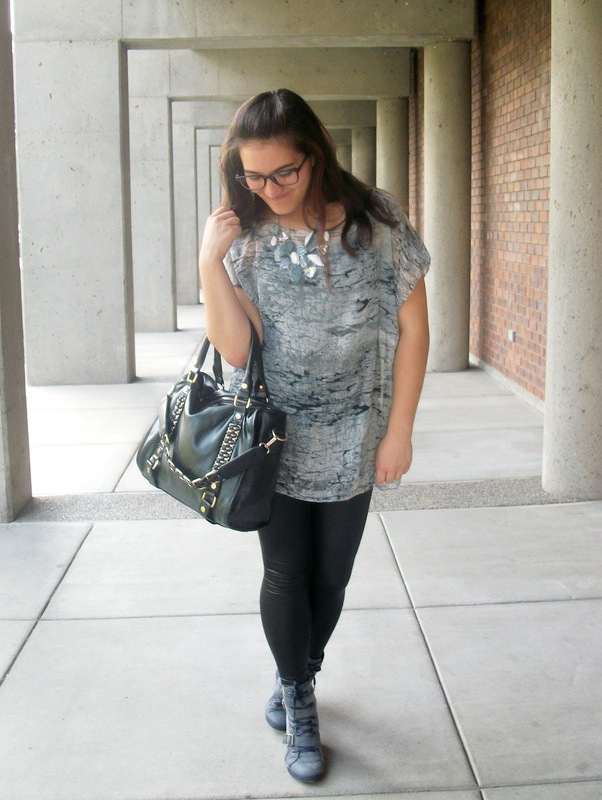 I'm really happy with how these faux leather leggings turned out from Oasap too! I've been wanting to test out the look for myself, but hesitated since I wasn't sure how it'd look on me. I've mentioned how I get self conscious about my muscular calves, right? I'm getting over that, but still, the thought of clingy black leather on my legs was a bit intimidating. But I'm so pleased I took the plunge - these look so edgy and will work perfectly as we switch to fall! Not to mention, this awesome bag from The 7 Senses - it's roomy and perfect for carrying my school books and folders in style. Oh, notice how I'm wearing glasses more? Hehe, I got a new frame from Glasses Shop, and they're even bigger and nerdier than my last pair! I absolutely love them, and a lot of people have complimented me on these. From classmates to customers to co-workers, these definitely grab their attention! Check out this top. Its from Vivid Blueprint, and its definitely going on my "New Favorites" list. 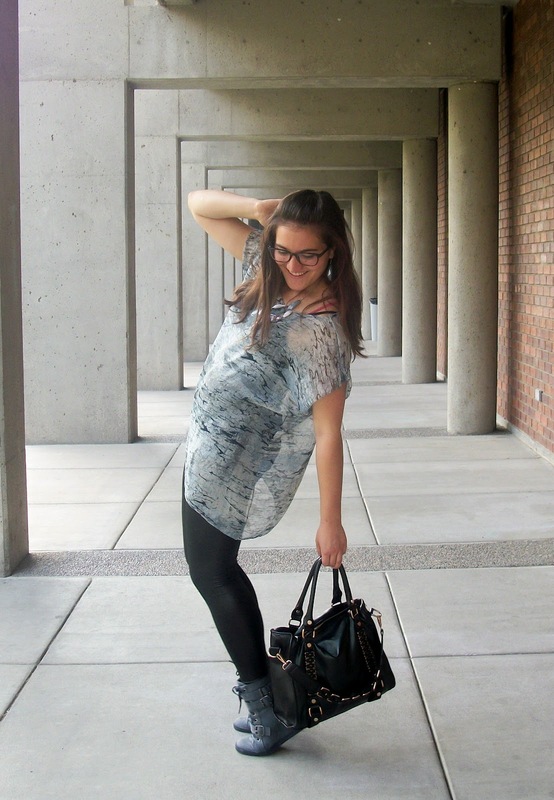 The sheer, oversized design is gorgeous, not to mention its got that marbled pattern going on! 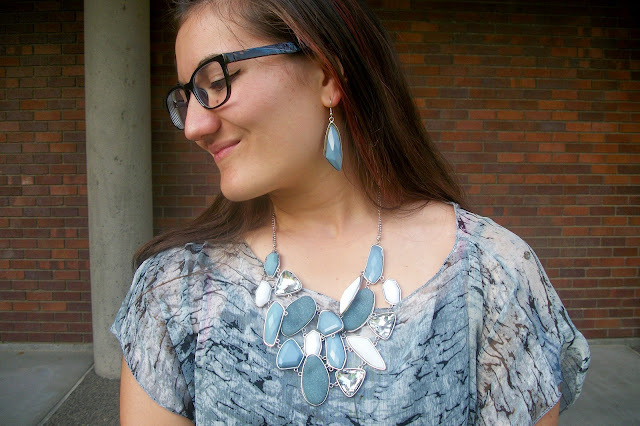 Plus, it was a match made in heaven with this statement necklace. You'd think they were made at the same place and were meant to go together! So on Thursday, I had my PE classes, which are great stress relievers. I don't know what I'd do without them. However, during one of the drills in volleyball, I think I pulled something in my upper thigh. It seriously hurts now every time I take a step! Looking back, I suppose I did stretch a little unnaturally trying to dig a spike...aha. My team ended up winning though (there was one awesome moment where I aced three serves in a row, which won us a round)! I've tried stretching the spot where it hurts, but it still twinges every time I bend my leg. Urgh. Hopefully it's better by next week. In other news, I got a call from the Sears Portrait Studio here - I'd forgotten about this old application I'd turned into them during the summer! Apparently, they're still interested, and have scheduled me for an interview later on next week. This is something I'd really love to pursue, because one of my hopes for the future is to become a photojournalist, and this could be some good experience! However, it could be a lot to take on. I'm still working at Golden Corral, which has provided me with some good hours and works around my school schedule, so I don't want to give that up. If I could get this job too, I'd be working two jobs while going full-time to college. Ack! So we'll see how the interview goes, and from there, I might have to make some decisions over what to do. PS: And don't forget about the InDressMe Giveaway going on here! wow that top is so pretty! Have a nice evening with Patrick - sometimes sitting together watching a movie is the best date after a long and busy week! 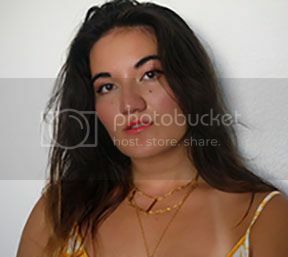 Top and necklace is my fav :) Fanned you on Lookbook ...Would be glad if we can connect at my Lookbook page too !! Good god, I love EVERYTHING about this outfit! The colors, the leggings, the top, especially the shoes. Can I just borrow this entire outfit from you? Please and thanks. haha! Amazing look and colors! I love your shoes, necklace and top! What a gorgeous top! I love this outfit! Those wedges are just fabulous. I love this whole stone cold look of yours... it's definitely not boring like stones, hahaha! that top and necklace is gorgeous. I love that you want to be a photojournalist! In another life and time that's exactly what I would want to do- embedded behind enemy lines, covering stories from war torn countries. Love the necklace and the leggings! I remember when last year I was considering buying similar leggings and was also afraid those won't suit me but then decided to buy them and was happy I did. now I even have several pairs. anyway, I like your outfit! combining leggings with slightly longer tees is something I like. and how cool are the bag and the necklace! I just looove the necklace! btw, good luck with the possible decisions you'll have to make! amazing print top and the necklace is awesome!! great shirt! love the print! O my gosh I LOVE your wedges!! You look so effortlessly pretty in these pics I love it! Pretty earrings and necklace too! Your bag is amazing and so are the wedges!! you, my friend, have NO REASON to be self-conscious about your calves. Your legs look long and AWESOME and HOT (in a not weird way) in these leggings!!!!!! And wowzzaaa the top and necklace WERE meant for each other! 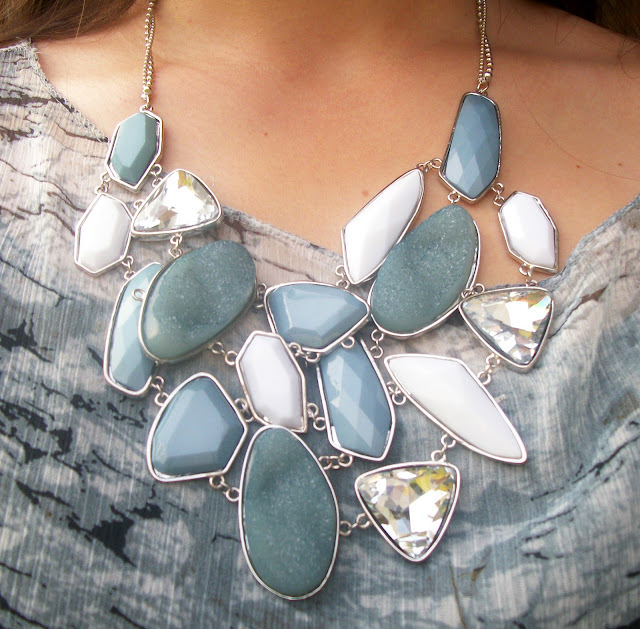 I'm a big statement necklace lover so i wanna get my hands on one of those! :) Love the shoes, too. I was thinking of getting the same pair from My Hot Shoes! Are they comfortable/easy to walk in, like, for REAL? Really cool outfit and every detail! Movie nights are always fun, simple is always good in my book! 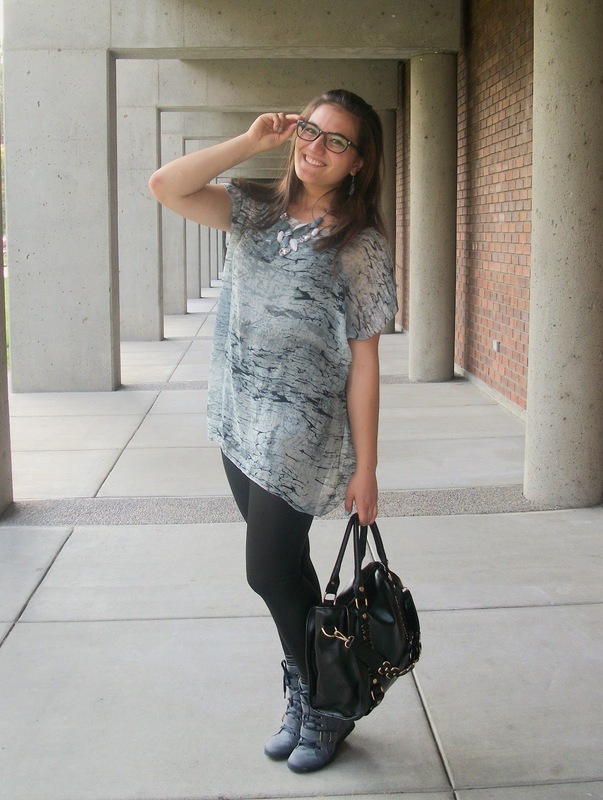 And for this outfit in particular, those faux leather leggings are so cute! I recently tried them too and they're so much fun once you get over the fact that you're out of your comfort zone... well at least with me anyway, haha! That top and leggings are a perfect match! Gorgeous necklace! Don't worry about the math--if you studied that hard I'm sure you did fine! If you didn't, at least you can learn from your mistakes. :) Just be positive, girl; you can do it! I definitely need some bigger and nerdier frames! haha Yours are too cute! Very pretty outfit, I love your necklace! I absolutely love your wedges! Cool outfit!! That bag is so gorgeous!! Love your necklace. Good luck on your interview. This is such a cool, edgy outfit! I love the leggings with the sneakers, it's such a sporty and trendy look :) And the top is so gorgeous (love how it's sheer). you are so right, it does look amazing with the statement necklace! and the Sears Portrait Studio job sounds like it would be a really amazing experience, good luck on your interview. Love the liquid leggings. : ) Very cool. Love those leggings! And the print on the top is super cute! Boots. Bag. Leggings. Top. Hair. You look magnificent in so many ways. I love this outfit on you! those shoes!!!!!!!!!!!! Omg i need them!! The leggings look great on you! I have several of these and I love to wear them with tunics. I'm loving all of this, but especially that necklace and those shoes! Such a cool look! Ah, Well, you look gorgeous...and you are just adorable! What a fun outfit, I love those shoes! Good luck with everything!